I’m still alive, folks ! 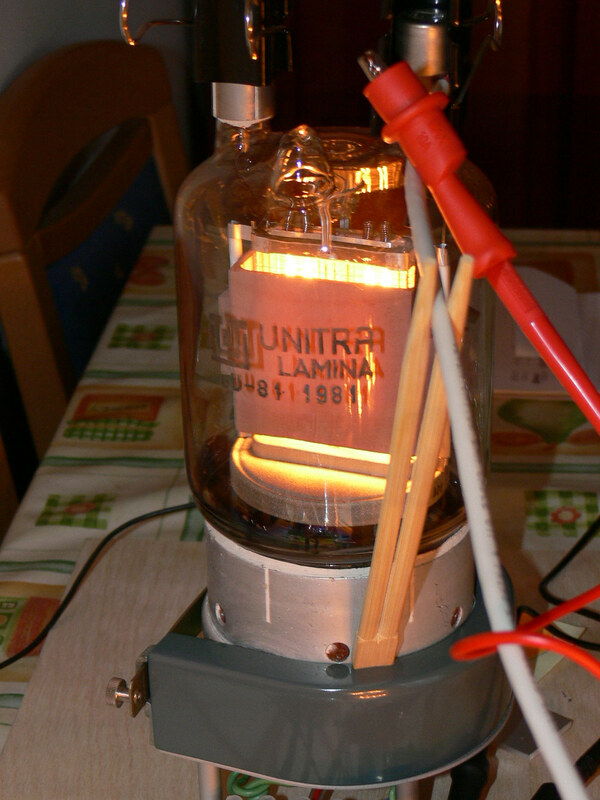 Recently I have been involved in testing a radio transmission tube, a Polish make, by Unitra Lamina. It is called the GU80. 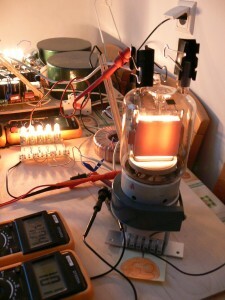 Did some “Red Anode” tests, so as to catch some real life DC operating points of the tube. 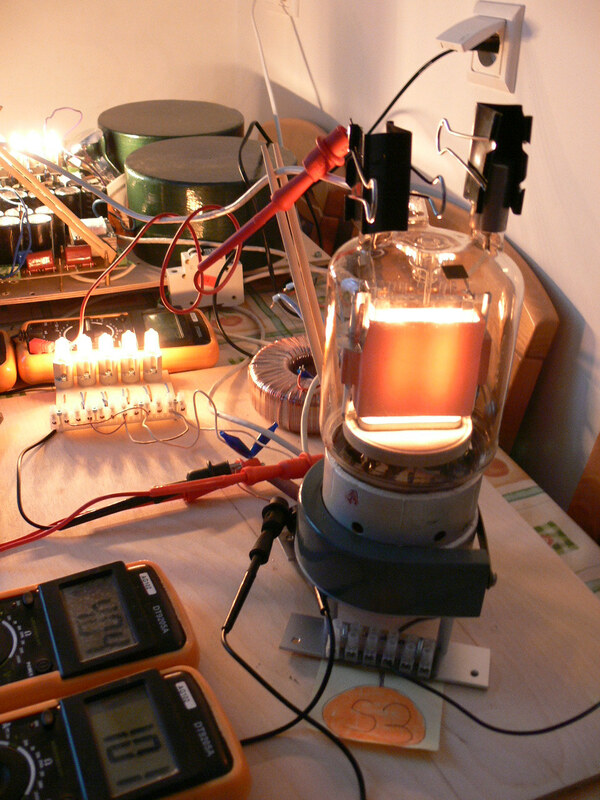 Started easy and gentle … But shortly after that, I cranked it up to the full spec limit of the tube. 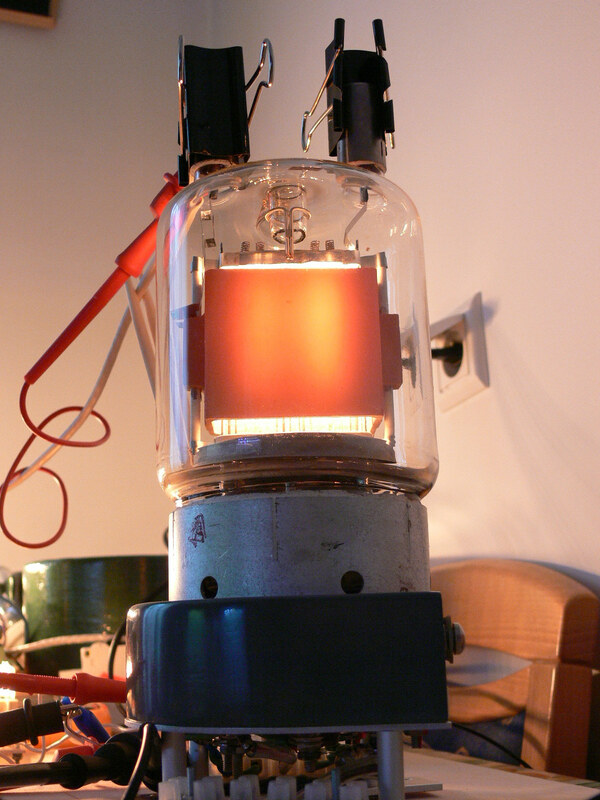 Plus the 140 Watts of filament heating. 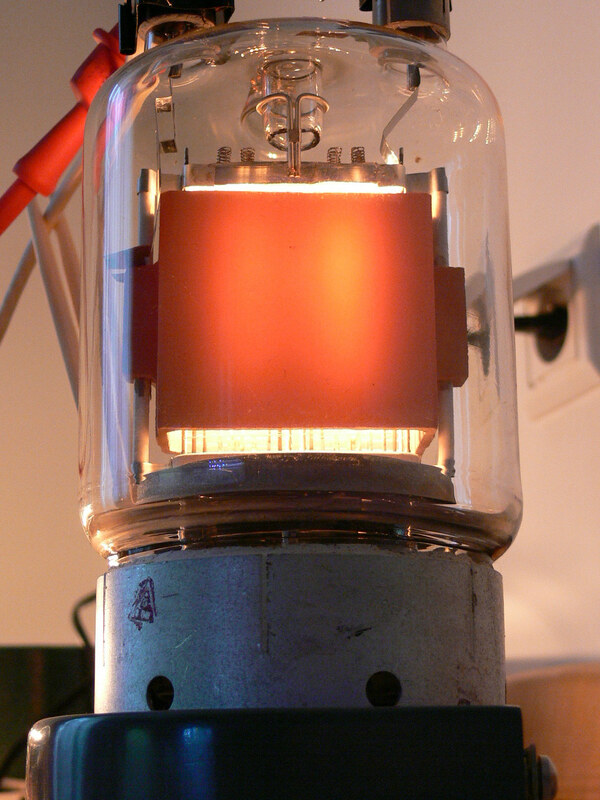 In the short term, it was even 0,4 A at -101V bias, but that was a tad too scary to maintain in the long run, as the color of the graphite anode started very quickly to convert from a reasonable orange glow (850 degrees centigrade ?) into something approaching a bright orange YELLOW (950~1000 degrees centigrade ?? ), which was too scary and stressful for my nerves. As I did not have any safety protection plexi sheet to screen and hold me harmless in case of an explosion of this potential shrapnel / grenade, I adopted a method of cooling down the anode a tad, then cranking it up wildly for 15 seconds, just enough time to write down the measurement readings off the displays of four voltmeters, and then instantly crank it down again, before the tube decides to melt or explode. The thermal latency of the somewhat bulky anode slab of graphite is somewhere around 30 seconds, so you can just get away with it. 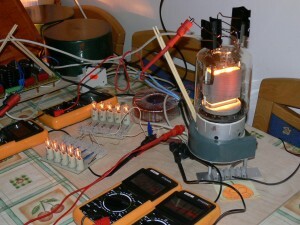 Later on, I added to this setup a variac transformer (not shown on the picture), just prior to the HV power supply, so as to facilitate an easier sweep through a range of possible voltages and parameter values, and to catch a set of as many DC operating point measurement data, as possible. The variac allows me to sweep through a range of AC voltages ranging from 0V up to 250V AC. 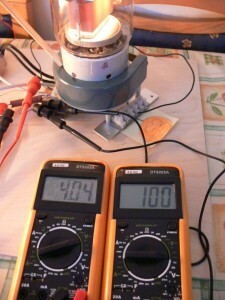 As these voltmeters have a range of only up to 1000V, the whole power supply is constructed as a “double-decker”. The voltages as shown are representative of the “upper half” (respectively) – spanning between Anode and S2, and the “lower half” (respectively), spanning between S2 and Ground (i.e. the S1 grid, actually). A yet different set of meters shall show the voltage drop on a 10 ohms cathode current measurement resistor, as well as the Cathode-to-Ground voltage, which essentially constitutes the auto-bias voltage for the tube. 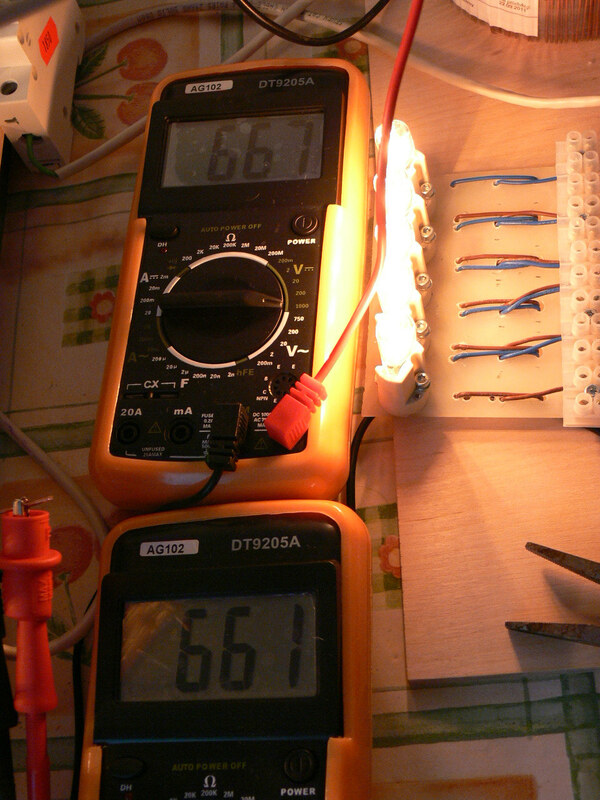 The right hand side voltmeter shows the cathode-to-ground voltage, at 101 Volts. Such a low value of negative bias is on the border of insanity, as the tube is exceeding it’s power capability by an unfair margin (above max. specs limit already). The voltmeter to the left - shows the voltage drop on a ten ohms cathode current sampling resistor, i.e. 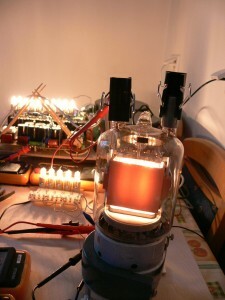 showing a current flow of 0,405 Amperes. In terms of the tube technical specifications, this is pure abuse. DC operating point conditions are repetitive and stable, time and again, independent of if the tube is hot, ultra-hot, lukewarm or cold. 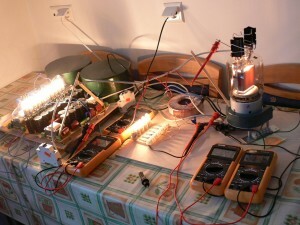 … which utilizes power PTC thermistors of sorts. 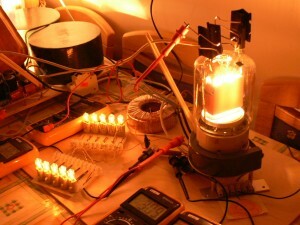 The positive temperature coefficient power thermistor being a set of G9 230V/28W filament light bulbs. 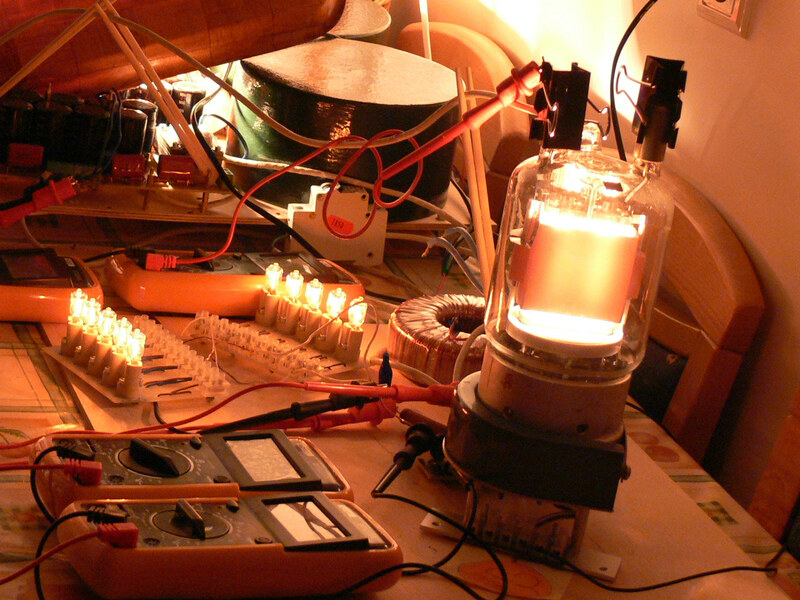 Call them hiend-audio bias bulbs, if you will. Now, why on Earth would Ziggy want to use auto-bias cathode light bulbs instead of cathode resistors ? 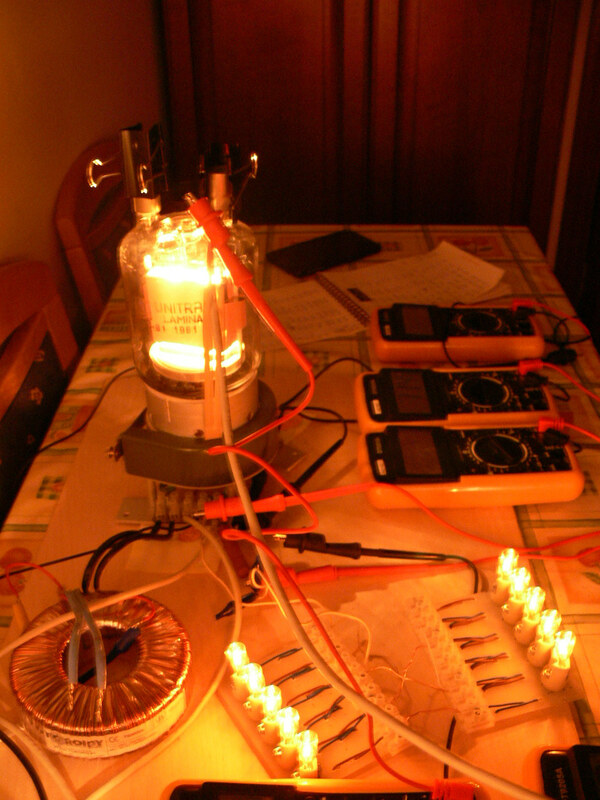 The filament based light bulb has this unique feature, that as the voltage rises upon it, so does it’s resistance. As the current flow increases, the temperature of the filament rises, hence increasing the resistance and restricting the current flow. Therefore, the rise of current is much less than “linear”. 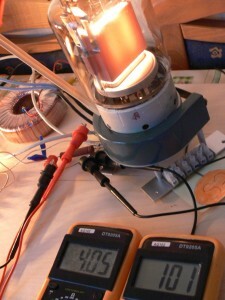 This provides for additional stability – including THERMAL stability, of the tube. That is most probably the reason why the GU80 has still not exploded in my face. And indeed, I *AM* testing some very crazy configurations, not excluding some funny business with the S3 grid, which, mind you, has not always been connected to the cathode. The S3 has a separate and independent pin made available on the chassis of the tube and socket. Indeed, this S3 was once connected with the anode, in my vague attempt to “triodize” this pentode. This idea has resulted with some very “spectacular” results …. which I am not keen on repeating any time soon. A minor explosion of an Anode to S3 connecting G9 light bulb, serving as a makeshift resistor and current limiter of sorts – seems to confirm this notion. I am still looking for the corpse of that bulb. It seems to have evaporated. I can not find it. Even the bulb socket exploded. Don’t ask me why. And yes, I was wearing my optical glasses. The power supply voltage sagged from 1700 V DC at idle, down to 1380 at full load ( ie. 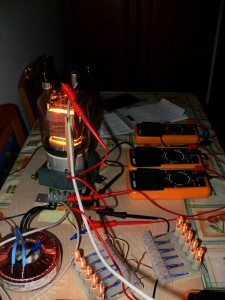 320V of sag, at a power consumption level of 450W). This is indeed very intriguing, as the transformers in the power supply are a powerful set of dual 800 VA rated toroids. So why the sag? Maybe it is the chokes within the PS filter section. 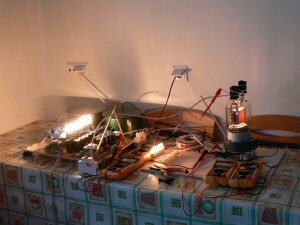 This is a view of the full makeshift kitchen table test bench. 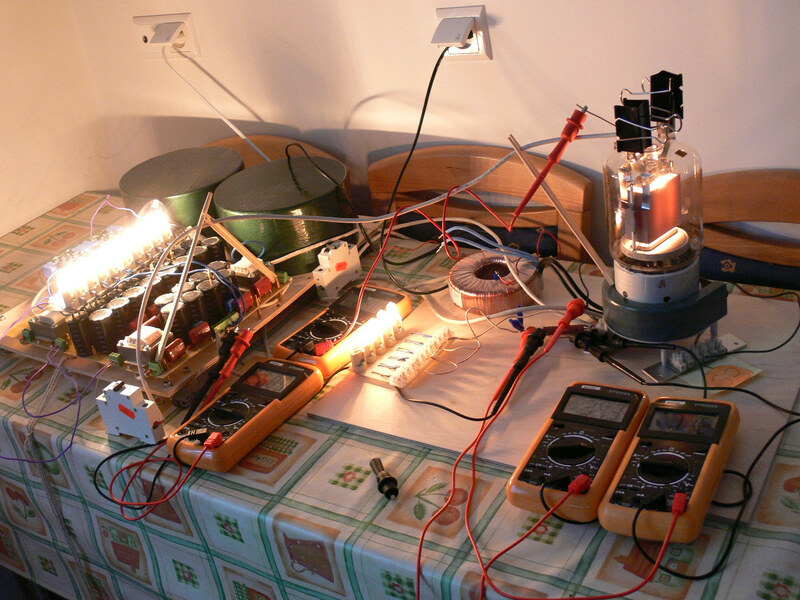 The row of series connected 10x 230V/28W light bulbs in the power supply which are seen at the far right, firing at full blow and glow … are nothing more than a dummy load for the power supply. But why stress the power supply with such an overkill dummy load, consuming a huge amount of PS current? I needed to come up with some sort of “quick capacitor discharge” resistor, one that shall withstand up to 2000 Volts … hence the idea do series connect 10x G9 light bulbs. Works fine, and in case of emergency, they provide an ultra quick discharge, not longer than 1 minute in duration. Mind you, you do NOT want to be left with a PS power supply capacitor supply bank charged up to close to 1700 Volts, after you switch the mains off. This would constitute a real death hazard. Besides, the bulbs provide a visual warning that hands clear, that the PS is packed and loaded with lethal energy. As soon as they dim out to oblivion, we are visually confident that the lethal danger has subsided. All in all, I consider this as a fair and reasonable trade-off … Some extra energy wasted but providing me with a higher chance of survival. 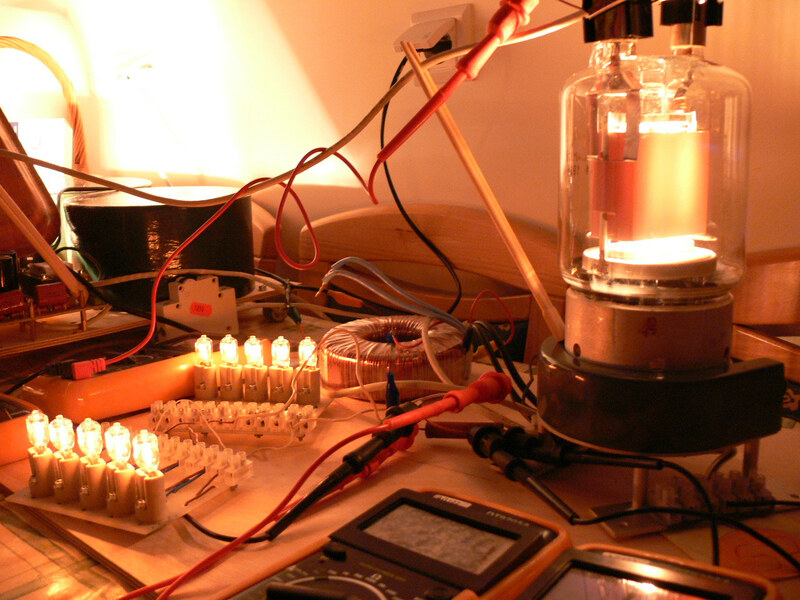 And besides, the dummy load provides a good approximation of a second tube, allowing to get a fair approximation of how the PS voltages will sag in the final configuration. The makeshift kitchen table test bench setup, so as to take off some real life DC operating points. 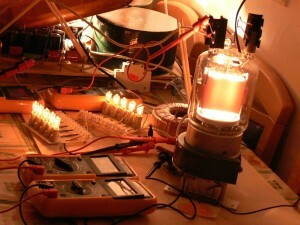 The 10 G9 bulbs are arranged in two rows of sockets. Each bulb is 230V/28W. (B1 || B2 || B3 || B4 || B5) + (B6 || B7 || B8 || B9 || B10) + 10 ohms current sampling resistor. This crazy little setup is The “Ziggy Turbo-Auto-Bias” (C) 2014 by hiend-audio.com, and it has the special feature of a positive temperature coefficient, which provides for an even MORE stable bias than traditional auto-bias. Call it an “Auto-bias SQUARED”, as such term provides a fair representation of the state of nature. 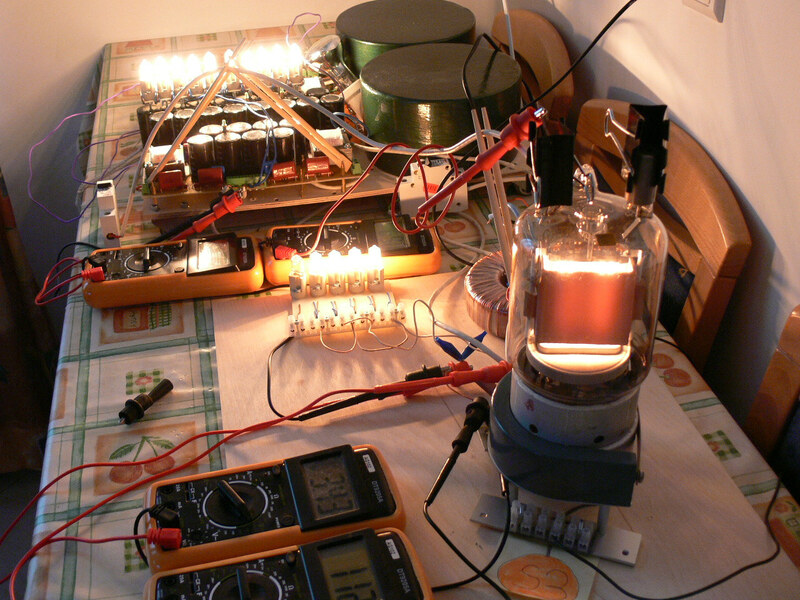 Due to the current limiting feature of the bulb filaments, which raise their resistance as the current flow increases, this setup provides for an ultra-stable DC operating point. 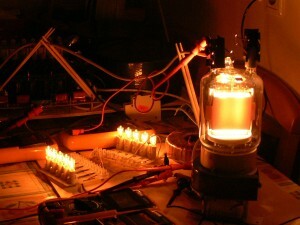 Not only does the notion of the “basic” auto bias mechanism stabilize the cathode current of the tube, but additionally, should the cathode current misbehave and start to increase for whatever reason, this shall instantly translate into a higher temperature of the filament, a higher resistance thereof, and an even higher voltage drop, hence increasing the cathode voltage and hence increasing the negative S1 grid bias even FURTHER. Auto-Bias SQUARED. Fret not, I also have a solution to that particular problem. 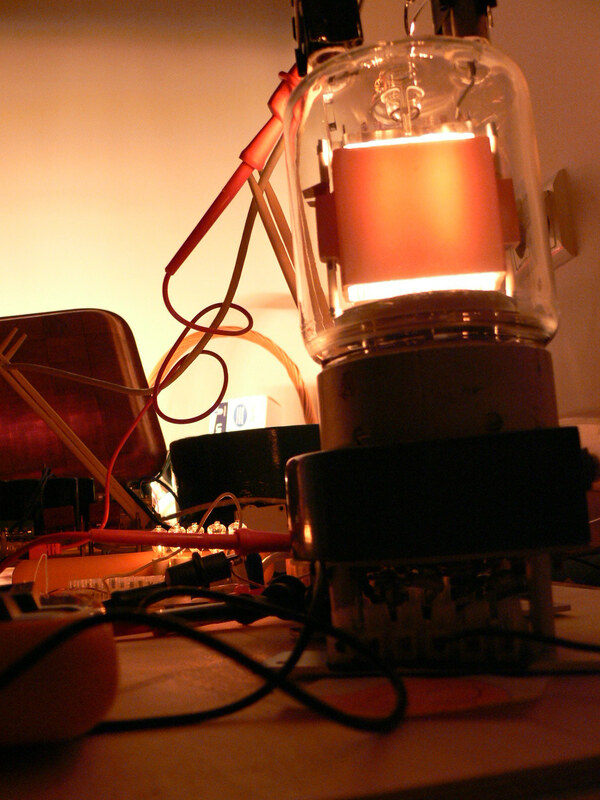 An Ultra-Path of sorts … A capacitor thing. An alternative route for the AC signal. In other words, this “Ziggy Turbo-Auto-Bias” thing is relevant for the DC conditions only. But if we were to consider the AC current path … that is a totally different path and a totally different story. Manageable. True colors. No graphic program tweaking here. … and this is how it looks WITHOUT the flash lamp, with just a slight tweak or tune-up of the contrast and brightness toggles. This photo was made using a flash lamp, so as to get good exposure. Visible are the 0,404 Amperes, the 100V of bias, and the red hot anode (which the photo-flash did not swamp) with the tube dissipating some 550W … 100W more than the maximum permissible limit. You do not want that particular cable accidentally falling off from the top of the tube in a haphazard manner. 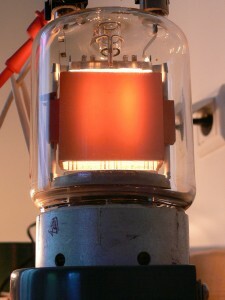 There are also available similar Russian made tubes. 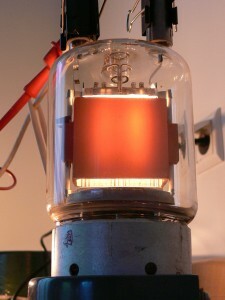 They are called GU81M. Almost the same thing. 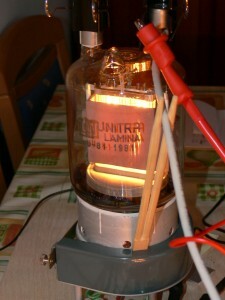 The GU80 tube operating at slightly above maximum permissible load, ie. 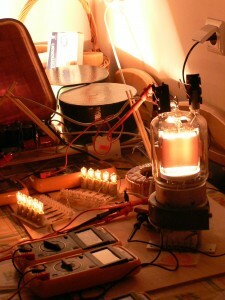 0,4 amperes, running off from approx. 1400 Volts. This is equivalent to c.a. 560W. 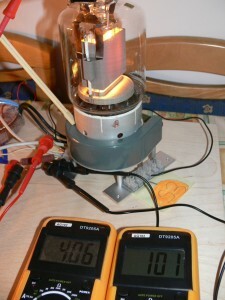 Add to that 140 watts worth of filament heating. I managed to take off readings representative of quite a few DC operating points during this session. The variac was really a true helper here. 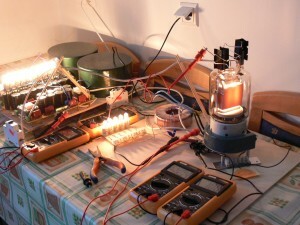 The readouts that I have obtained will be useful when recreating the true characteristics of the tube, prior to ordering a push-pull OPT transformer, with optimal technical specs. The data readings shall give me some insight as to the possible choice of operating point, and provide a verification of the real life specifications of the tube, as compared to the “published” specifications, which are possibly outdated or imprecise. All tests were conducted in pentode mode, not significantly exceeding the maximum allowable S2 Voltage of 600V.